· It is pseudo - amphoteric surface active agent. It acts excellent hair conditioner. Our organization is widely trusted in offering Finefacia Hair Control Tablets to our clients. These are composed in an accurate manner and are offered in excellent packaging material which includes indication for proper use, special instructions and precautions related to same. These do not produce any side effects. We are offering these at reasonable price. 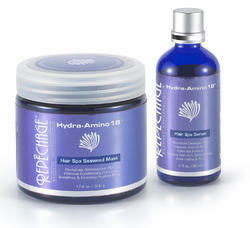 Moroccan Argan Hair spa kit for hair anti ageing and organic treatment for dry hair. Ayurvedic hair pack made with natural herbs used to clean hair in traditional and ancient ways. Makes hair strong and healthy. For All Hair Types : R.K’s Aroma Hair Softener is a specially created formula enriched with excusive combinations of ingredients that helps keep hair, manageable, silky and smooth all day. No more frizzes, no more entanglements. With a Fabulous fragrance.